The thing that makes Blackbeard a particularly fascinating historical subject – aside from being a maniacal brute with a penchant for setting his own hair on fire, that is – was that he was one of the few pirates to keep logs of his exploits. In fact, he was one of the few pirates who could actually read and write. Step Into Reading is a multi-part series of books intended for budding to novice readers. Amongst their Step 3 offerings (grades 1-3) you’ll find Pirate Mom by Deborah Underwood and illustrated by Stephen Gilpin. The story follows the adventures of Pete, a young boy (and pirate fan, naturally) who’s own mother is turned into a pirate through hypnotic suggestion. She proceeds to terrorize the entire town (although in a relatively harmless manner – this is a kid’s book, afterall) while Pete does his level best to keep things under control. The story is cute and fun, as are the illustrations. Pete’s facial expressions are particularly fun, as are the small sight gags hidden throughout (the pirate teddy bear, the Amazing Marco’s newborn in a top hat, etc.) 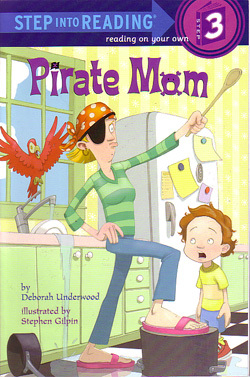 Learning readers should find this a very fun story, as will their pirate-loving parents. This entry was posted in Books and tagged children, underwood by Bilgemunky. Bookmark the permalink.